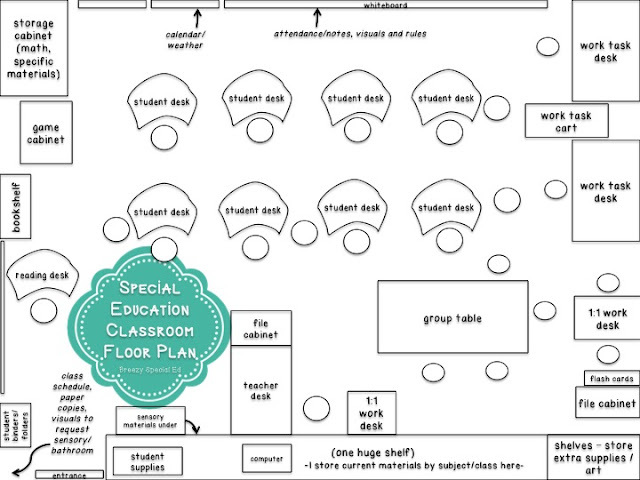 Have you been thinking about how to set up your special education classroom? Do you feel like you never have enough space? Are you thinking how in the world am I going to be do more than just the typical desks in my room? I've been there. As a high school teacher, I have a typical high school sized classroom. I'm not complaining, it's not like a closet or anything...but I have to admit I do get jealous of elementary sped teachers and all of their space! I'm here to show you, that even with a small/normal-ish sized room you can do some pretty cool stuff! I need individual desks that face the board, because I have two other classes that function more like typical classes that take place in my room throughout the day besides my morning block/caseload students. (Don't even get me started on the stupid kidney shaped desks in my room. Once you get a communication device and an iPad on that desk, there's hardly any room for work! So I've been in the process of switching them out to normal rectangle desks whenever I can find one.) I need about 8 desks for the morning and if I need more room for the other classes, I use our "reading desk" and "group table" for more seating. All of my students start the morning in their individual desks during our morning meeting/class time and then rotate throughout the room (and sometimes back at their desk) based on their schedule. View from the back corner by the door. You'll notice I also have unique obstacles to work around in my room. I have sliding barn doors that need to remain accessible... a tech door that is always locked and the tech people come in my room at the most inconvenient times, four huge poles along the walls, and one huge shelf against the back wall. I'm sure we all have some random stuff like that! Make it work for you. The poles are magnetic, so I stick stuff to them. I put posters on the tech door. The shelf stores a lot of the materials that we are currently using (even though its annoying I can't put any furniture on that wall!) And...well...the barn doors are just annoying. Ha. When you don't have a ton of space (or maybe even if you do) you have to use the walls to your advantage! My work task stations are along the wall in the corner. I like this area for a couple of reasons. Students are facing a wall so they are less distracted. Also, they are out of the way so it doesn't feel like it takes up a lot of space. I have my teacher desk perpendicular to the shelf in the back. There are a few reasons for this. I can run straight back to the computer easily this way when projecting or showing something on the screen. Also, when I'm working on my desk during lunch/plan, I often have students pop in, and this way I am also facing the door. I have a little desk behind me for when I'm working with or testing a student. This space (and the one on the other wall) gives students another option for a place to do 1:1 teacher work besides just their desk. I like giving choices like this when possible. It also allows us to space out the room if certain areas are getting crowded. Our group table in the back (as pictured in pictures above) is my FAVORITE! We do our journal in the morning here and any other small group work. This space is also great for playing games. Students' binders and individual schedules are right next to to the door when they walk in so that the first thing they do in the morning is grab their binder and go to their desk. This is also where they leave their take home folders. The bookshelf and reading area is in front of the sliding barn doors. I have a rug here because some students enjoy reading on the floor, while others prefer to use the desk. Books (most of them are adapted books) are somewhat organized by topic in bins. 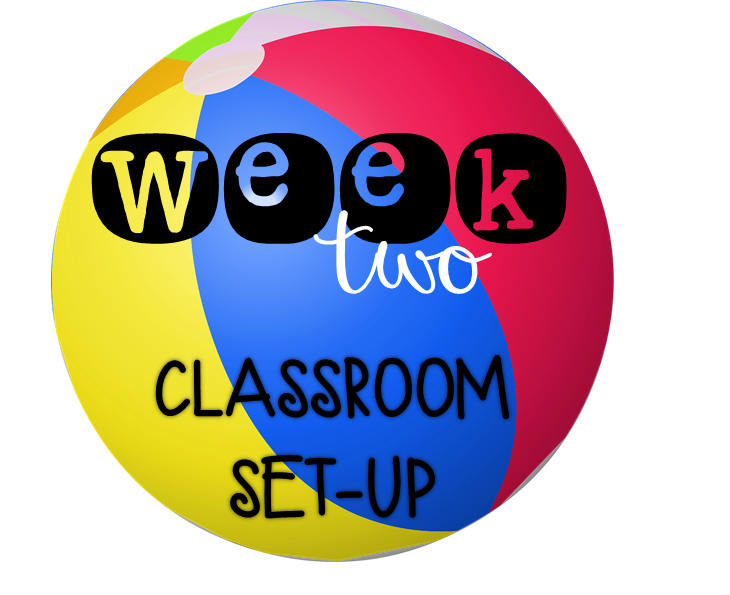 Next to the books is our classroom game closet and then our bigger storage cabinet with manipulatives, puzzles, and other educational materials. All student supplies are labeled and are located at the back of the room for easy access for students. I keep supplies like glue, markers, stamps, scissors, crayons, etc on these tops shelves and students are quick to learn where to find what they need and are mostly independent with getting and putting away their supplies. Under the shelf I store most of our sensory items, such as fidgets, lotion, weights, weighted vests, and headphones. Hope you enjoyed that classroom set-up tour and I hope that it gives you more ideas for setting up your own classroom! Continue checking out other special education teachers' classroom set ups by going through the blog hop by clicking on the ball below, next up, Sped Station! Check back next week for back-to-school forms! Update: Check out and get free back to school forms HERE. You do have some interesting things to work around in your room, but you've made it work and it looks great! And eventhough you don't like those single kidney desks, I think they are too cute! I wish i had your space. By the time i get a changing table, peivacy screens, pt table, standers, and then 3 wheelchairs in, i barely have room for 2 rectangle tables and chairs.